Poornachandra Tejaswi is the name that Kannada music lovers have been chanting of late. He makes his composing debut with director Pawan Kumar’s first crowd-funded Kannada film, Lucia, that will soon be released by PVR under their Director’s Rare category across several Indian cities. His folk-based melodies with fresh voices have gone viral on the web. 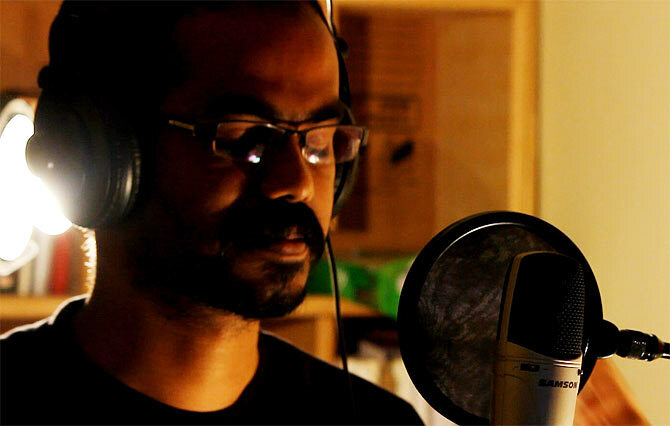 He was born and raised in Srirangapatna and having completed his education in Mysore, was working for a software company when he decided to call it quits and go back to his first love, music. 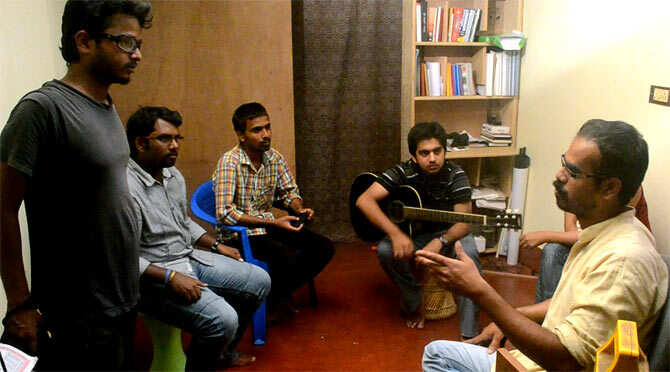 Poornachandra Tejaswi gives some insights into his compositions and his career. Did you quit your job because you wanted to be a music composer in the film industry? Right from the beginning I was not interested in a regular job. I joined this theatre outfit called Niranthara Foundation in Mysore and was actively involved in acting, production, musicals and street plays. I was a big fan of BV Karanth’s songs and gained some exposure and experience in the theatre circuit. Right from my engineering days, I was interested in getting into the film industry and composing music. Do you have any formal training in music? Not really. Because of my passion for music, I made an effort to understand the nuances of composing. We have our own rock band called Stone Age since three years in Mysore. 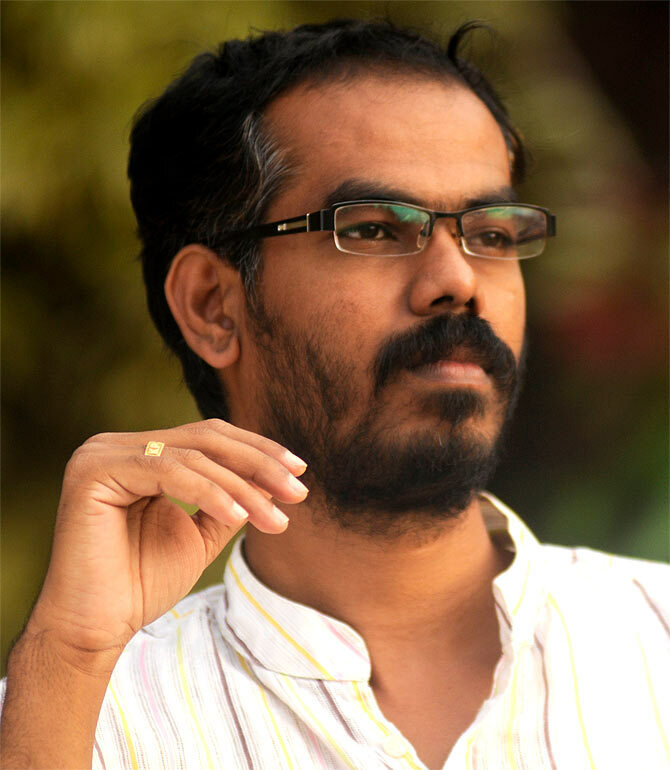 I had seen Pawan Kumar’s first film, Lifu Ishtene and was really impressed with his style of narration. I started following him on Facebook and some time around December 2011, he announced his next film would be Lucia. I was captivated by the title. I composed a scratch tune, called it Lucia, and shared it with him on Facebook. He found it to be catchy and replied with an appreciative note. After a day or two he got in touch with me and said that he found himself humming the tune all night and that it was a sign of good composition! He asked me to meet him in Bangalore with more samples of my compositions. So you were on board soon after that? Not really. In Bangalore, he introduced me to Yograj Bhat who was equally impressed with my compositions. He gave me a few rejected lyrics from his old films and asked me to tune them for him. They were quite impressed with the results. But Lucia wasn’t a crowd-funded film then, and I was a nobody from Mysore, so for them to sign me for a commercial venture was not feasible. Even I did not have much hope that it would work. I was just glad that I got to meet these people who appreciated my talent. Pawan Kumar told me to get some exposure by working with other composers for some time. So, it is only because Lucia became a crowd-funded project that you got this opportunity? Indeed. As soon as Lucia was to be a crowd-funded film, Pawan was supremely confident that he would make a good film and he could take his own decisions with respect to the production. I was on board soon after that. I went back to Mysore where I have a small studio set-up in my house. I started composing and sending them by email or uploading them on to sound-cloud. He would listen to them and give me feedback and request for changes to be made that would work well with his script. Your songs have become very popular online, particularly Jamma Jamma and Ee Maya. Yes, I just started composing with some dummy lyrics and called it Jamma Jamma. Pawan and I took it to Yograj Bhat for the lyrics. Yograj Bhat liked what he heard and said even if they were dummy lyrics, they sounded good. He told me to retain it as it was and he wrote lyrics for another song, Helu Shiva. Ee Maya is a melody that goes very well with the screenplay. I am happy with the way it has come out. You have used new singers in the album. Yes, all of them are new. Naveen Sajju was known to me. He is a very popular orchestra singer and I have witnessed his performance in Mysore several times. I got him to sing the track. Ananya Bhat is from Mysore too. I auditioned her and got her to sing the track for Nee Thorebeda. Bappi Blossom was a part of my band, Stone Age. 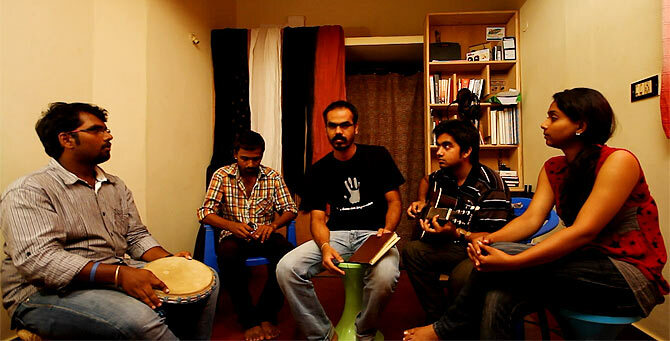 Udit Haridas was a part of another band in Mysore. He sang Ee Maya. Usually, what happens is that the track singers put in a lot of effort and render the song and then the final album is released with established voices. We thought why not release the album with these singers who have done a great job. So we decided to retain their voices in the final album. Are you happy with the reception the album has met with? It has been phenomenal, especially online. In the first week of release it was leading on iTunes. I cannot talk about audio CD because that market is declining gradually due to the online presence. I hear Lucia songs wherever I go. Thinbeda Kammi went viral on YouTube. People from the industry too have been calling and congratulating me. Puneeth Rajkumar and Ganesh called Pawan Kumar and conveyed their regards and wishes to me. I hope to work with Yograj Bhat and Soori in the future. Most of the songs are folk based. Yes, the protagonist comes from a small village in Mandya to Bangalore. The screenplay demanded folk based tunes. Pawan’s first film Lifu Ishtene, though well made, was very urban and did not have a mass reach. We wanted the music in Lucia to have a mass reach. Talking about folk music, Sneha Khanwalkar has really brought rustic tunes from the interiors of India to films like Gangs of Wasseypur. Would you like to do something similar? Now, when there is a demand for fresh music, folk music will be back in the mainstream. That is the reason Thinbeda Kammi from Lucia has such a huge reach. How was the experience while re-recording? Have you added any more songs during the process of composing background score for Lucia? 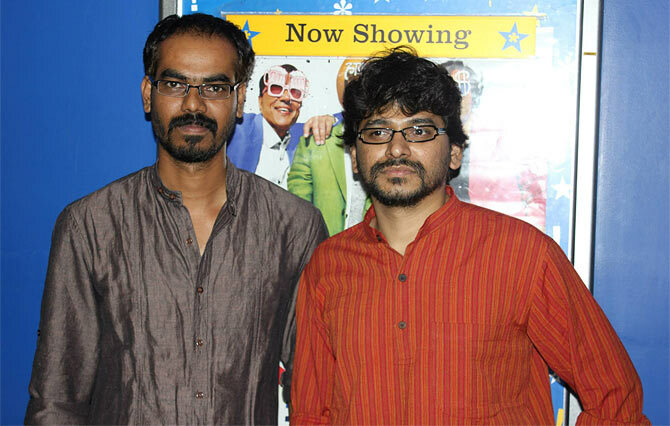 After Pawan Kumar gave me the film post editing and effects, I realised I had a challenge ahead of me. It was quite challenging to do the re-recording. My confidence has gone up several notches now. It is a very tricky and intelligent film. All songs go well with the narrative. Apart from that, we had added a pathos version of Jamma Jamma. Then we have Ee Maya flute version and a Lucia Theme too. What are your thoughts on the reception of film music in Karnataka? People do not classify music into languages; they will listen to any music that is appealing, irrespective of the language. In that sense, Kannada film music faces severe competition from Hindi and Tamil. But ever since Harikrishna and Manomurthy entered the industry, things have started changing. Who are your personal favourites among the music composers? I like A R Rahman a lot. Then there is Hamsalekha and BV Karanth.